There are strict alcohol limits for drivers, but it's impossible to say exactly how many drinks this equals. It's different for each person.The legal limit for alcohol content in the blood is 80 milligrams per 100 millilitres of blood or 35 micrograms per 100 millilitres of breath. The same factors also affect how long it takes your body to process alcohol. It is often said that it takes 60 minutes to process a single unit of alcohol, but this can be much longer. Don't assume you are safe to drive the morning after an evening out, even if you are not hungover and feel fine. If you had a lot to drink, there is a good chance that you will still be over the limit for much of the next day. If you're caught, you will still face the same penalties as you would have the evening before. 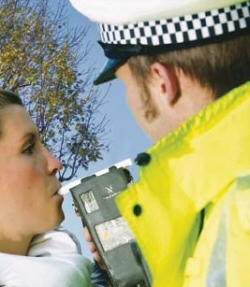 There are strict drink driving penalties if you are caught over the limit. The problems of drink driving are generally well known, but drivers aren't always aware that drugs can have a similar impact on their driving. Section Four of the Road Traffic Act 1988 states that "a person who, when driving or attempting to drive a motor vehicle on the road or a public place is unfit to drive through drink or drugs is guilty of an offence". You're unfit to do so because you're on legal or illegal drugs. It's illegal in England and Wales to drive with legal drugs in your body if it impairs your driving. It's an offence to drive if you have over the specified limits of certain drugs in your blood and you haven't been prescribed them. If you're taking them and not sure if you should drive, talk to your doctor, pharmacist or healthcare professional. There is a real possibility of being caught drug driving. Drug driving is a priority for the Police, and drug use can be detected through the Field Impairment Test.. The pupil dilation test is designed to test for the presence of drugs. Counting out 30 seconds sounds easy, but drug users either under-read or over-read time. Walking in a straight line nine paces forwards and then back checks co-ordination and balance. Raising a foot in the air six to eight inches off the ground tests balance. Touching finger to nose with eyes closed test co-ordination. If you're caught driving under the influence of either alcohol or drugs, you will face a substantial fine, driving ban and potential imprisonment. But the potential consequences if you aren't caught are even worse. By driving under the influence of either drink or drugs, you endanger yourself and other road users. Causing a fatal accident while driving under the influence will lead to a two-year ban and a potential of 10 years in prison.